Extract of French maritime pine bark. Reduces capillary permeability, making it effective against chronic venous insufficiency. 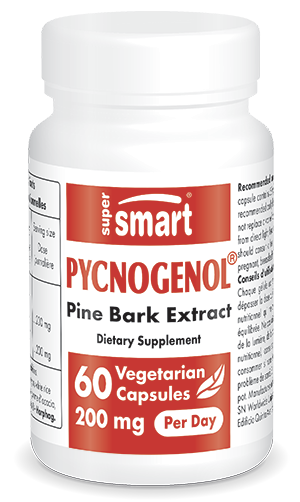 Pycnogenol® is an extract of bark from the Landes maritime pine, containing in between 65 and 75% proanthocyanadins, highly-bioavailable compounds that readily cross the blood-brain barrier and have a strong affinity for collagen. A large number of studies have shown that Pycnogenol® is one of our most potent antioxidants. At the University of Berkeley, California, Professor Lester Packer has demonstrated that its antioxidant activity is twenty times greater than that of vitamin C, and 50 times greater than that of vitamin E. Pycnogenol® is so powerful that it recycles oxidised vitamin C and protects vitamin E from oxidation. It stimulates the production of antioxidant enzymes inside cells, thus boosting their first line of defence against free radicals. In a comparative study, Pycnogenol® proved to be a more active antioxidant than co-enzyme Q10, lipoic acid and grape seed extract. An in vivo study showed a 40% increase in antioxidant potency in blood following three weeks' supplementation with 150mg pycnogenol a day. diabetic retinopathy: five studies involving more than 1000 patients showed that Pycnogenol® repaired permeable capillaries. Progressive deterioration of vision ceased and in some cases, visual acuity improved slightly. Since most diabetics have an increased risk of developing retinopathy, preventive supplementation should begin as soon as the diabetes is diagnosed. menstrual pain: women suffering very painful periods were given 30-60mg Pycnogenol® a day for a month, starting 1 week before their period. The majority experienced a significant reduction in cramps. circulation problems: Pycnogenol® increases production of nitric oxide and inhibits constriction of the arteries induced by stress hormones. Pycnogenol® improves circulation in elderly individuals. It inhibits superoxide radical in blood flow, helping to maintain a healthy circulatory system, and protects blood vessel walls. The most significant improvements are in peripheral microcirculation (hands, feet, legs and eyes). risk of myocardial infarct and heart attack: Pycnogenol® normalizes platelet activity which is responsible for the development of blood clots following vascular damage, but unlike aspirin, does not affect coagulation in wounds. sports endurance: intense physical activity increases free radical production in the body by 10-20%. Pycnogenol® counters these harmful effects and improves circulation, encouraging an optimal supply of nutrients and oxygen, and helping the body achieve continuous optimal performance. Athletes receiving Pycnogenol® showed a 21% improvement in endurance in a controlled treadmill test. internal cosmetic and skin ageing: the constituents of Pycnogenol® have a particular affinity for collagen and elastin which help prevent their destruction by lytic enzymes and free radicals and maintain smooth, firm skin. Pycnogenol® supplementation protects against sunburn: when 21 healthy volunteers were supplemented with Pycnogenol®, it took double the strength of UV radiation before erythema (redness) appeared. Veinous insufficiency: older women are particularly vulnerable to this problem, which if left untreated, can lead to ulceration and necrosis. 15 clinical studies involving over 500 patients showed that Pycnogenol® reduces oedema, pain and other symptoms associated with vein problems. These studies were conducted with doses ranging from 30 to 360 mg a day: the highest doses were, in some cases, effective after just five days' treatment and lower doses were used over several months. It is therefore recommended to take a higher dose at the start of treatment, reducing the dose once the problem has eased. In Switzerland, Pycnogenol® is registered as an OTC medicine for treating veinous insufficiency and improving circulation. Pycnogenol® is one of the most powerful and scientifically-supported nutrients you can take to maintain and protect your health. Its relatively high price, however, has discouraged many people and we have therefore made huge efforts to reduce the cost per milligram in order to make it available to a greater number of people. Along with Pycnogenol®, you may also be interested in carnosine and alpha-lipoic acid for their significant antioxidant activity. By combatting oxidation of cells by free radicals, as well as glycation, carnosine is considered one of the most promising anti-ageing compounds. For its part, the action of alpha lipoic-acid - referred to as a ‘hyper antioxidant’ or ‘universal antioxidant’ - may help prevent numerous diseases. Recommended use: Take one or two vegetarian capsules a day for preventive purposes or to boost antioxidant protection. If required, take three or four capsules day on the advice of your therapist.